I stopped by a railroad ditch on my way home from the grocery. 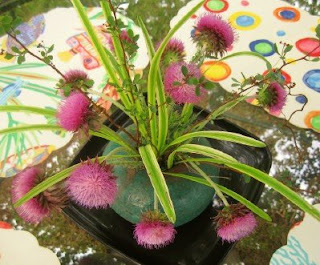 Spunky thistle for the outside table. Fun thrift store placemats, 25-cents. Extra tall stalks jammed in a vase for the bedroom dresser. A wild bunch to offset the fireplace symmetry. 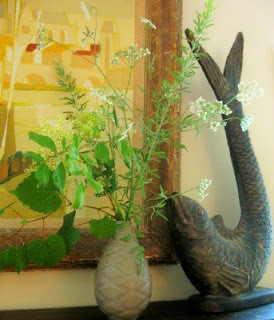 Trumpet vine and Queen Anne's Lace for the kitchen counter. You are one talented young lady. And so was coming over and hanging out with you. Thanks, Meredith! I did these early in the morning adn then left them on the outdoor table while I cooked. So far, this has been a largely bug-free method for me! Hope your computer problems are speedily and thriftily resolved! 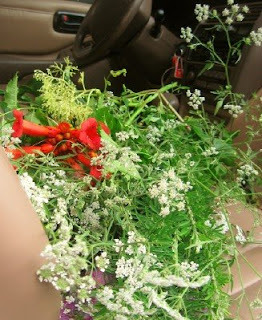 I have to remember to put a pair of kitchen shears in the glove box for flower picking! Pretty! I love the look of wildflowers. Ditches are the best for flowers! I always see the prettiest things growing on the side of the road. One of these days I should actually stop and do what you did. 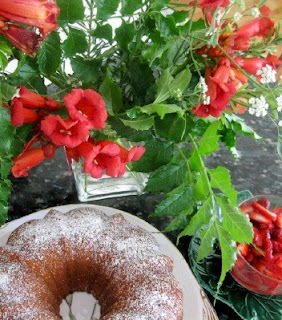 How did you learn to arrange the flowers nicely? Your bouquets always look lovely. If I put a bunch of flowers in a vase, it would look like my five-year-old had jammed them in. Beautiful all around!....you have such a good eye, Meredith. 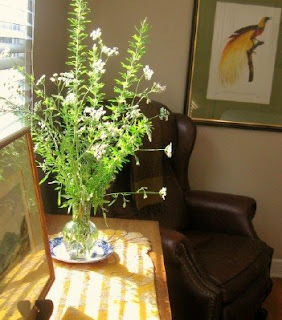 The flowers are beautiful BUT you may want to check and see if you can pick them from the side of the road. Some states consider it illegal and if you are seen by a cop in an ill mood or a stickler for protocol they might give you a ticket. I don't know the policy in all states but in Alabama where I live it is illegal to pick in certain places and certain flowers.Take care. Good point. In TN the only illegal places are state and national parks plus certain wildflower areas planted by the state. These came from a weedy little jungle that runs along an industrial railroad line. Just a warning, that thistle looks an awful lot like a Canadian Thistle, a highly invasive and noxious weed. It really is pretty, but I'm not sure you want them growing all over your yard.